South Dakota is nicknamed The Mount Rushmore State and is the 17 most extensive state in the United States. South Dakota is home to over 800,000 people with 150,000 located in the largest city Sioux Falls. The capital city is Pierre. The bordering states are North Dakota, Minnesota, Arkansas, Nebraska, Montana and Colorado. The major highways servicing the state are I-29, I-90, I-190 and I-229. Air travel can be used through Sioux Falls Regional Airport and Rapid City Regional Airport. 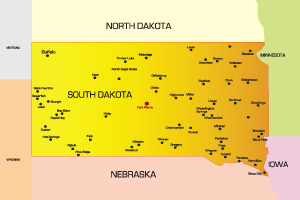 Notable universities in South Dakota are South Dakota State University and The University of South Dakota.